David is inspired by Shaker and Windsor furniture. These traditional styles have stood the test of time as their beauty and practicality have an ageless quality. David also relishes the opportunity to design something completely original which suits his clients needs and tastes perfectly. Although other wood is available upon request, David prefers working with birch as it is locally available and lends itself well to the traditional art of chair-making. David selects each tree himself with an eye not only to the finished product but also to the environmental impact of removing the tree from its ecosystem. 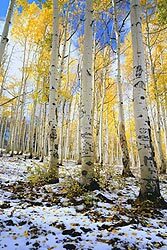 A tree is only chosen if it meets the highest of quality standards and if removing it will benefit the surrounding trees by providing more sunlight. Thinning the forest in this way ensures the health and vigor of the remaining trees will be strengthened. Wood is obtained from logs by splitting (riving) rather than sawing. This process is often performed right in the forest, eliminating the need for heavy machinery as the split pieces can than be carried out by hand. Riving allows pieces to be thinner and lighter while still maintaining their strength and integrity since the grain will run the full length of the piece. The wood is used in its natural “green” state. This means it hasn’t been processed at a mill or run through a kiln to dry it. At SilverTree, David’s goal is to bring the human touch to all of his work. As a result the majority of his work is performed using hand-tools and human powered machinery. Most of the pieces are shaped on a shaving horse or on a pole lathe. These devices have been used by craftsmen for centuries and create an intimate connection with the wood not possible when using large power tools. Pieces requiring a curve are bent in a traditional steam box. Once all the pieces are ready, dry tenons are put into wet mortices. This method exploits the natural shrinking properties of wood. When a dry tenon is inserted into a wet (still green) mortice, the mortice will dry and shrink fit around the tenon for a remarkably strong joint. 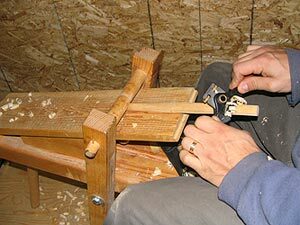 A tapered tenon is used where the legs join into a solid wood seat which means that use actually tightens the connection. Seats are hand-woven by David from fibre rush, shaker tape or cane. Solid wood seats are carved using hand-tools.